2) You get what's on the truck, can be a generous 15 cubic meters (about 17 trailer loads) or more. 3) NO GUARANTEE that you will ever receive a load of mulch. This is a standby system for participating Tree Contractors who may need to empty the truck in your area but the final decision is always up to the Contractor. 4) Excess mulch is NOT the responsibility of the Tree Contractor or MulchNet and will not be removed. It may be a good idea to have a chat with neighbours about sharing a load before registering. 5) Not all loads will be the same, it all depends on the type of plant being mulched (hardwood, softwood, stringy palm frond, etc.) and the sharpness of the blades. 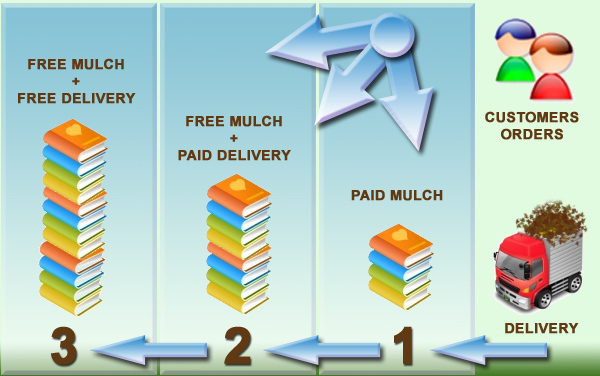 However, the variation of small & large particles is the secret to good mulch.